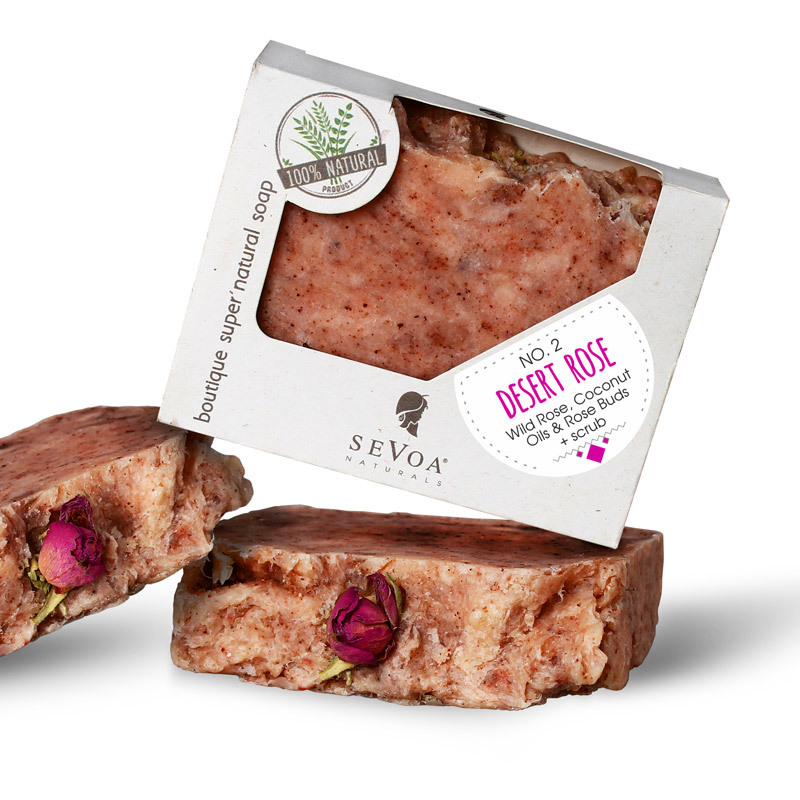 Each soap additionally contains fresh Wild Rosehip Oil. When added raw and pure at the right stage of production it maintains all its properties providing ultimate goodness for the skin. It also contains Coconut oil, Essential oils and gentle Apricot scrub. Handmade and completely vegan. Apply directly on the skin when taking a shower or use with a bath sponge. The smile is a must! Contains: Fresh oils: Wild Rosehip Oil, Geranium Essential Oil; Color: Rubia Tinctorium; Exfoliant: Apricot kernel powder; Rosa Damascena buds; Saponified oils: Coconut oil, Olive oil, Rapeseed oil, Palm oil. The name reveals part of the ingredients. The “desert” theme has to do with the scrub we’ve added to the soap. In the very beginning we used super fine white volcanic sand to achieve the scrub effect. It didn’t take us long to realize we needed something a bit coarser for a better exfoliation effect and so we started using apricot kernel flour instead. Next comes the “rose” theme hinting at the soap’s colour, scent and the fact that it contains wild rosehip oil.